As sweet as cinnamon: Blush Giveaway! I thought it is time for a Giveaway! the 'Blush' charm pack and a paper pattern for my 'Blushed Quilt'. No jumpng through any hoops... just leave a comment! Thanks for the chance to win such a lovely charm pack :) Barb. Love your quilt! I love Blush but never ended up getting any, don't know why, but I have my fingers crossed now! Your quilt is Blushing...love it!! I would love to have a Blushing quilt too!! Please throw my name into your give away hat!! Thanks so much for the chance! No hoops to jump through - Awesome Dawen, cos sport is not my best subject. Thanks for the chance to win! Your quilt looks amazing. What a shame you are not giving the quilt away too ... but get the chance to win the charm pack and the paper pattern will be fine for me. I love your quilt.It is very friendly of you to give us the chance to win this lovely charm pack. I seem to have a things for charm packs at the moment! Thanks for giving me the chance to win one! Beautiful quilt and the Blush charm pack looks too good for words, Dawn. Thank you for your generosity and also sharing your talents with us. Blush has very cute colors. I love it. And I love the chance to win it. Thank you for giving me the chance. Blush has gorgeous colors - I am wrapped as a scrapbooker and quilter that you can get the range in both mediums - paper and quilt fabric. Love the blushed quilt. And would love to win the charmpack and the pattern to make it. Have a nice day. Warm summer weather in Norway today too :) Out on the porch with my stitchery. I LOVE the blush fabrics! I would love a chance. Thank you! The Blush range of fabrics are beautiful Dawn. Love your quilt also. Thanks for the chance to enter the draw. Would love to win. Thanks for the great giveaway. The quilt is pretty! Thanks for the chance to win a lovely charm pack. Thank you for this chance! I can see a lot of uses for that fabric! I am not into any sporting activities. So please put my name into your hoop for a chance to win this lovely fabric without blushing. Thanks for a great giveaway. If I win I would love to make the same quilt!!! What a lovely quilt! Please enter me in the drawing. Thank you. Nice circles...mine usually turn into ovals! Blush is a gorgeous quilt! Thanks so much chance for the chance. Thanks for the chance to win . I love charm packs. Can't get enough of them. Hope this is open for Canada. Thank you for the lovely giveaway Dawn. Blush is such a soft feminine line..just my speed! thanks for the opportunity! Oh a charm pack needing a home to be hugged and loved.... thanks Dawn for having this fab give away. I love this fabric colours. Me, me, me. Pick me! I love charm packs! I just love that line Blush... Love to win it with your pattern! Enjoy what you do!! Great give away! Thanks so much. Love how your circle quilt turned out! Mmmmmm pretty!! 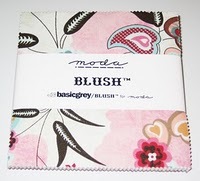 I just love Blush and you've made it look so fabulous in your quilt too :o)!! I'd love to be in your draw gawjus Dawn!! Lovely fabric and pattern. Thanks for the chance to maybe win some. Oh, I love to have this chance to win the charm pack. Thank you! I love giveaways and can always use fabric and patterns. Blush what a great fabric, thanks for the chance of a giveaway. Love that "Blush" fabric. I gave away a jelly roll of it a little while back and didn't keep any for myself! Thanks for the chance to win! And...your quilt is awesome! Your Blush quilt is simply gorgeous! I would so love to win the charm pack...keeping my fingers crossed. Thank you for the chance to win some Blush. Your quilt looks lovely. Happy days. Please include me I would love to win the charm pack . Would love for you to add my name to the list and THANKS for the chance!! They look to yummy. Dawn--love your quilt!! Please, please enter me in the give away...so lovely. Beautiful fabric and quilt. I would love to win the fabric and pattern. Thanks for the chance! I just LOVE the blush fabric and your quilt is beautiful! Blush. What a lovely name for fabric. I'm not to sure what a charm pack is. Looks good though... the blushed quilt looks beautiful. Hi Dawn, your quilt is lovely... and a blush charm pack - drool, sound wonderful! Cute and simple...just the way it should be! I'd love to win your pattern and a Blush charm pack. Count me in. here is another comment - please delete previous one. Blush is beautiful, thanks for opportunity to win. How sweet :) Lovely charm pack and pattern.. Thanks Dawn for the opportunity to win a Blush pack...I only recently discovered this range. very nice indeed. I love the circles on squares of your quilt. It looks great. Thanks for the great giveaway. Oooo, I love "Blush". I have the jelly roll and a charm pack would be great to add into the mix! The blush fabric is gorgeous and of course I'm interested in the opportunity to win it! Great giveaway! your circle quilt looks lovely...thanks for a chance to win!! Your quilt is beautiful. Thanks for your generosity! Dawn, you really are as sweet as cinnamon! Thankyou for giving us all a chance to win those beautiful charmed squares and pattern. I really enjoy your blog. Thats a lovely pattern and a pretty charmpack..Would love to win this give away. Yes please lovely lady ! Such pretty fabric to play with ! I'd love to win the charm pack, especially if it helps me make a quilt as lovely as yours. Thanks so much for the opportunity to win the giveaway! beautiful quilt - would love to win! Thank you for the chance to win some Blush. Your quilt is wonderful. How nice of you to give away your spare Blush and your pattern, and I hope I win them:). I hope I'm not too late. Blush is lovely. Thank you for the chance. Thank you for the chance to win a charm pack of Bliss!